Expected to showcase three Windows Phone 8 handsets along with a 5" Android phone-tablet hybrid. Looks like September is going to be a busy month for tech enthusiasts. Nokia is about to announce its next generation of Lumia handsets today, Apple has scheduled its iPhone 5 announcement on the 12th, and now Taiwanese manufacturer HTC has sent out invitations for a media event on the 19th. Received by US websites, the announcement states that the event will take place in New York. The invite itself doesn't hint at the announcement of any specific device. However, it's likely that the company will unveil its upcoming Windows Phone 8 handsets: the recently-leaked Accord (aka 8X), accompanied by the top-end Zenith and an entry-level Rio. We might also see a high-end Android phone with a 5" screen to take on Samsung's GALAXY Note II. 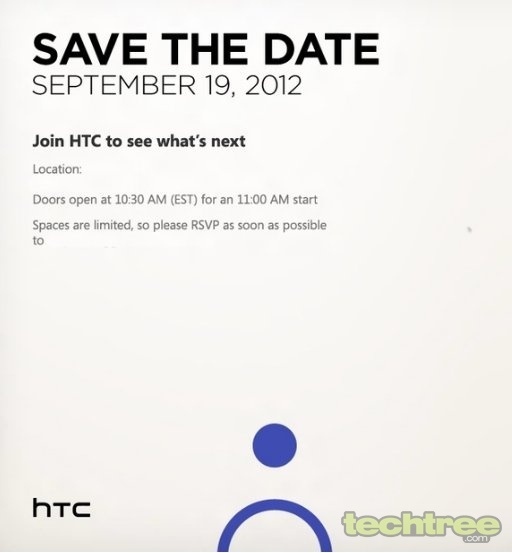 HTC fanboys, mark your calendars and keep your eyes peeled — we'll bring the news as it breaks.